The beauty and intricate look of bronze at an affordable price! In both Old and New Testaments, Gabriel is the angel of the Power of God, assigned with words such as great, might, power, and strength… and ever the angel of Mercy. In the New Testament, he is most known for announcing to Zachary the birth of the precursor, and to Mary that of the Savior. 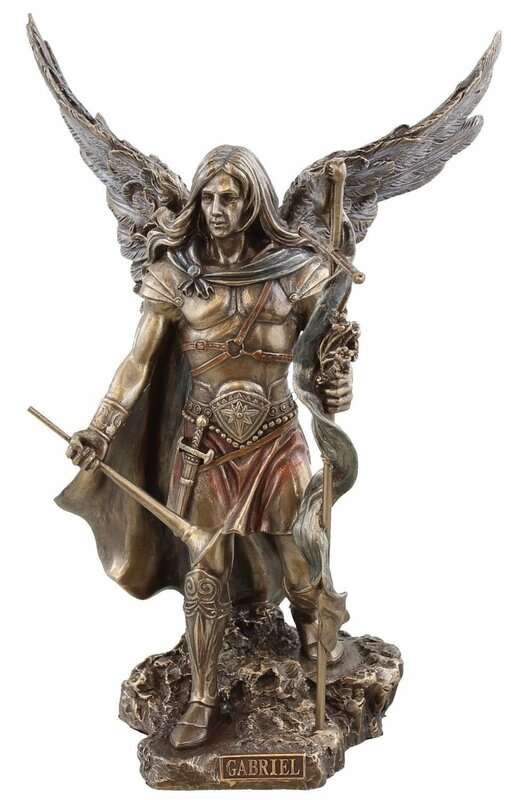 His strength and power are aptly represented in this bronzed resin statue, measuring a mighty 9”H. 9" H x 5.25"W x 3.5"D.
Messenger of God and patron saint of communication workers, won't you invite this handsome statue into your life? Gabriel is cast in a lightly hand painted cold cast bronze and shown holding lilies and a trumpet horn. He is suitable for indoor or outdoor living and will be sure to add a strong spiritual presence wherever placed.